Lateral View of the damaged maxillary beak, and the loss of the distal half of the previously repaired mandibular beak. 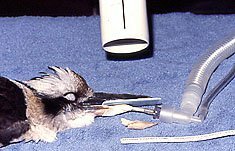 Preparation to X-ray the maxillary beak in order to determine the exact location of the underlaying vascular bed. 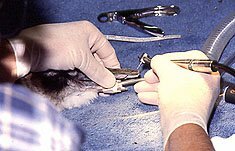 Removal of the damaged maxillary beak material in order to match up the opposing beak structure to improve function during regrowth period. 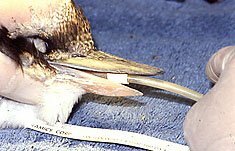 Utilization of un-orthodox ‘dental’ instrumentation to facilitate re-shaping of back to healthy beak structure. 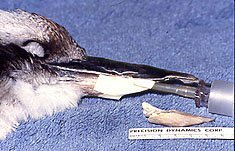 View of final post traumatic modification of beaks. 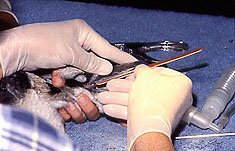 Both upper and lower grew back to species specific dimensions in time, and this restored masticatory apparatus functioned well during the recovery period.